Elegance’s signature colors, entitled Peppermint Gardens. 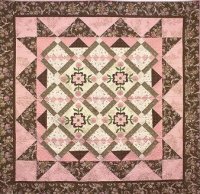 Robyn Pandolph designed the beautiful pink and brown fabric for RJR, while Peddlecar Quilts designed a pattern specifically for this line of fabric. Our sample was constructed by Annette Ezell, B-Ellen Kallas did the applique, Carol Duque of Calico Junction did the quilting, and the binding was sewn on and hand stitched by Rita Steinmetz. · Buy the pattern for $9 with the first month’s fabric kit for $28.95. · Each month after, for 4 months, purchase the fabric kit for $28.95. Binding for the quilt is included in the last month’s kit. · We have several backing choices available for purchase. · Come see this gorgeous quilt hanging in our store! There are limited BOM kits available for purchase, so these probably won’t last long. Three different Kids camps will be offered this summer. The Beginner’s Kids Kamp is required for any further classes. Students should bring their own sewing machine, and basic sewing supplies, but store machines are available for use during the camps for an additional fee of $15. Kamp fees include all materials to finish class projects except thread, needles, and basic sewing supplies. More information can be found at http://www.heirloomelegance.com/classes.htm. Kids will learn basic sewing skills and how to use a sewing machine. They will make a lap quilt, pin cushion, book organizer, and drink wrapper. Price is $145. In this class, any students who have taken previous beginner’s sewing classes with us, or who have advanced sewing skills, may take this class. We will make a lap quilt, sewing machine cover, a sewing machine mat and organizer, and a clutch bag. Price is $165. Students who have taken previous beginner’s sewing classes with us, or who have advanced sewing skills, may take this class. The students will make a Halloween treat bag, reversible holiday placemats, a Christmas bowl, a man’s apron, a Halloween pillow case, and Christmas ornaments. Price is $160. June 1st, the price of Creative Grids rulers and templates was increased. Before the price increase, we ordered several of their rulers and templates so that we could pass on the current price to our customers. Just be aware we still have a limited number of these helpful tools. Faye Medina, who is our main teacher, has had family problems recently. Her son, Brian, had a severe wreck Friday, May 24, 2013, totaling Faye’s car and injuring himself severely. We hope you will keep Faye and Brian in your thoughts and prayers.